The collection includes: Purple Wave petunia; the original and still the most popular petunia ever. Easy Wave Red petunia; the bright red version of Purple Wave. 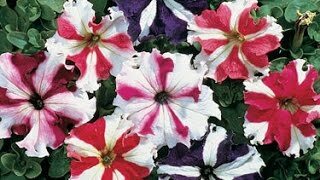 Shock Wave Denim petunia; a vigorous, mounding plant that overflows with blue mini-blooms. Petunia Wave™ Collection is rated 4.2 out of 5 by 5. 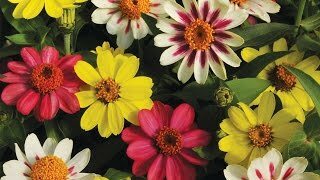 Rated 5 out of 5 by Jerry 1963 from Flowers galore! About 2-weeks after setting the plants into the ground, we got nothing but flowers for the past four months! They're growing like crazy, and I didn't even fertilize them! I suspect they will continue to flower until the first frost in October. Thank you for offering the Petunia Wave Collection as plants. Growing them from seed would have been too difficult for me. Would recommend. Rated 5 out of 5 by Moma from Love the Petunia Wave Collection Ordered this last year and it performed wonderfully. I would recommend to all who live in hot dry climates. The colors are great! Rated 5 out of 5 by MPierce from Purple Wave Petunias As soon as my seeds arrived we planted them in stained concrete planters. The flowers were absolutely gorgeous, the color was amazing. Our neighbors borrowed our planters to take Easter pictures.